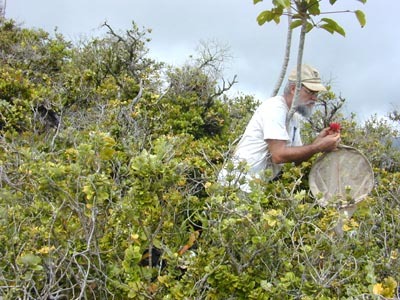 Kapa‘a, meaning "the solid or closed", lies within the ancient ‘ili land division of Ka ‘Ōhi‘a, which translates to "the ‘ōhi‘a lehua trees are tabooed." Ka ‘ōhi‘a falls within the larger ‘ahupua‘a land division of Kailua. To the north [of Kapa‘a] is Kawai Nui. The vast expanse of Kawai Nui was once rich with the delectably fat "mudfish": ‘o‘opu ku‘ia. The ‘o‘opu was lured by the famous mythological Mākālei tree, the supernatural fish-attracting tree transplanted by the ancients from Pali‘uli (Hilo). The broad silent waters of Kawai Nui were once guarded by the mo‘o goddess, Hauwahine. Standing mauka above Kawai Nui in the misty distance is pleasant Kapa‘a, revered land of legendary ruler, Olopana.1 The northwestern boundary is a ridgeline known as MahinuiA, separating it from the Kawa Stream watershed of Kāne‘ohe ahupua‘a. The southern flank of Kapa‘a Valley is the hilly place known as UlumawaoA. The original "modern" Kapa‘a Quarry (begun in late 19494) occupies the former site of the ancient stone adze quarry of the same name. The Hawaiian civilization depended upon the stone adze as a construction tool to produce religious images, build homes and houses of worship, produce agricultural tools, manufacture weapons of war, and carve and shape the all-important fishing canoes and the impressively large double-hulled voyaging canoes which attained lengths of 120 feet and more.1 The first modern quarry in Kapa‘a Valley was filled by the City & County municipal waste landfill known as Kapa‘a Landfill, operated from 1970 to May 6, 19972. Stone pieces—adze blanks—were transported to villages around Kawai Nui marsh for shaping. Numerous grind stones can be observed near the marsh shore today, where chips and blanks are regularly foundA. Looking into Kapa‘a Valley from the vicinity of the Mokapu Saddle Road. A small portion of Kawai Nui Marsh and the Kapaa Quarry Road are evident beyond H-3 on the left. The now-closed City & County Kapa‘ Landfill occupies the center of the photograph. Because of the H-3 Interstate Highway, Kapa‘a is familiar to most windward residents. 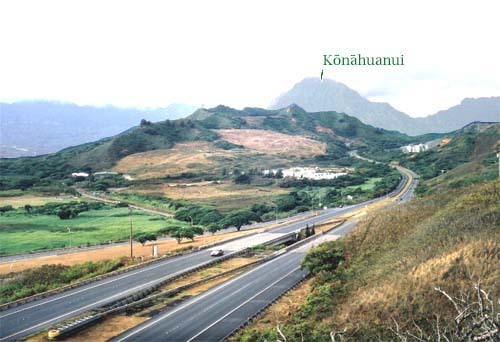 This highway passes from Kāne‘ohe to Mōkapu through Kapa‘a Valley, at the upper end through the saddle between Ulumawao and MahinuiB near Hawaii Pacific University. This four-lane freeway now dominates the upper part of Kapa‘a Valley, comprising some 13 acres (5.3 ha) or 2% of the watershed. 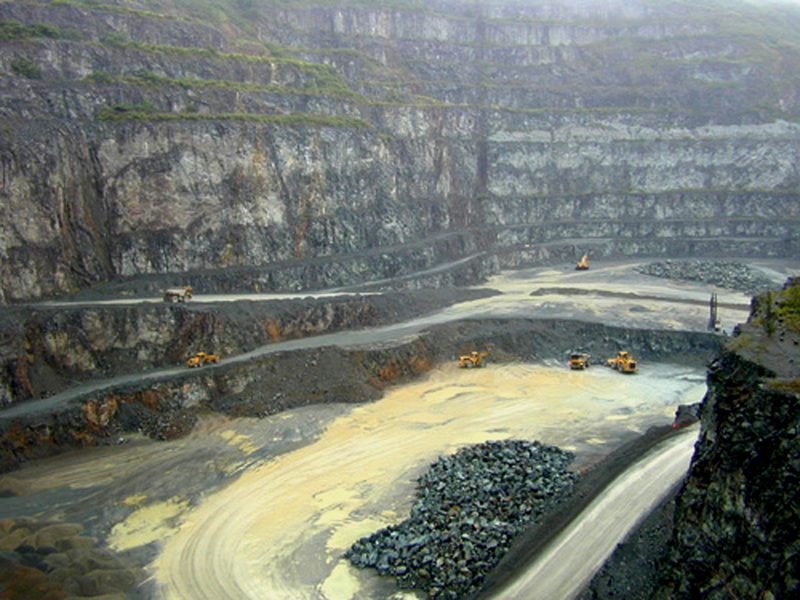 The highway divides much of the area between the two principal land uses: the Ameron rock quarry operation on one side (Photographs 2, 3, & 4) and the City & County solid waste facilities on the other (Photograph 1). But the division is not perfect. 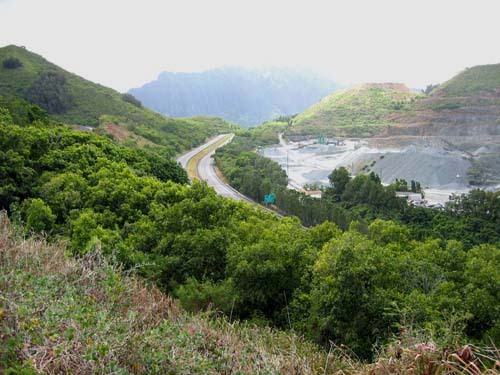 In the upper valley, Ameron has developed its Phase II quarry operation on the slopes of Ulumawao across the freeway from now abandoned Phase I. Looking towards the head end of Kapa‘a Valley, with one of the peaks of Ulumawao on the left, the H-3 where it enters the upper end of Kapa‘a Valley, and part of the Ameron quarry operation on the right. 1972. The western part, in the valley, was the Kalaheo Landfill from 1986 to 1990; then became a commercial green-waste facility. A model airplane park occupies a portion of the former landfill placed in Kawai Nui2,3. Vertical view looking down into the Ameron quarry (Phase I pit) in Kapa‘a Valley. The forested slope below the ridgeline at the bottom of the photograph is part of the watershed of Kawa Stream. 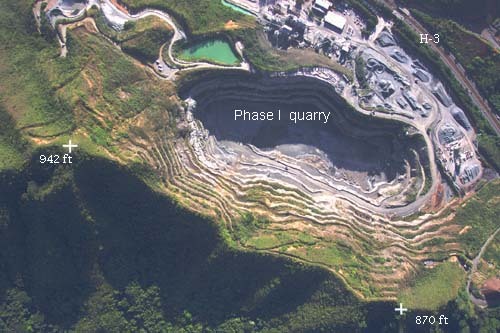 Bottom of the Ameron quarry (Phase I) operation in Kapa‘a. This quarry pit was the source of most of the construction aggregate used on O‘ahu. Abandoned as a source of construction material, it is now a lake. 1 Modified from "Cultural History of Kapa`a Quarry" written by Palani Vaughan for Ameron HC&D, May 18, 1993 (xerographic). 2 State of Hawaii Department of health, Solid Waste Section, Landfill Database - Oahu at CLICK HERE. 3 Young, R. 2005. Garbage in Paradise: A History of Honolulu's Refuse Division . Division of Refuse Collection, Dept. of Environmental Services. 4 HDOH. 2007. Total Maximum Daily Loads (TMDLs) for Total Suspended Solids, Nitrogen and Phosphorus in Kapa‘a Stream, Kailua, Hawaii . A It is possible to observe evidence of this commerece in tool-making at an ancient village site ("Ka Lā" ?) at Nā Pōhaku State Park Reserve off Kapa‘a Quarry Road. used in earlier USGS maps for just Ulumawao.